On October 29, just two days before Halloween, St. Martin's Press will release the long-awaited Corey Feldman biography Coreyography: A Memoir. It is a must-read for any fan, as it delves deep into the trials and tribulations of this actor's young life in Hollywood. Some of it is funny, some of it is heartbreaking and a great big portion of it is truly scary. In the book, Feldman talks in great length about his best friend Corey Haim. In the coming weeks, you'll hear a lot about what happened to the two teenagers behind closed doors, and a lot of it's not that pleasant. Instead of dwelling on that in our own review, we'd rather look at the work Haim and Corey Feldman have left behind. Specifically, in honor of the season, their horror movies. The pair met on the set of one of the all time greatest vampire movies ever made, and before they fell victim to drug and sexual abuse, they made some of the best-remembered genre fare of the decade. All of which is discussed in the book. They also made some cheapies later on in their careers that are enjoyable when viewed on their own merits. In celebration of Halloween, and to help usher in and point out that Coreyography: A Memoir will be available very soon (we definitely recommend the audio book, which Corey recorded himself), here is our special look at 'A Two Coreys Halloween: The Essential Horror Movies of Haim and Feldman'. Monster of Choice: Vampires. The Heroes: Comic book enthusiast and new kid in town Sam Emerson (Corey Haim) and Vampire Hunter Edgar Frog (Corey Feldman). The Premise: Teenage Vampires have taken over Santa Clara, California turning it into the murder capitol of the U.S. as they party all night and sleep all day. It's up to Frog Brothers Edgar and Alan to help Sam kill the head vampire and save his older brother from eternal damnation. 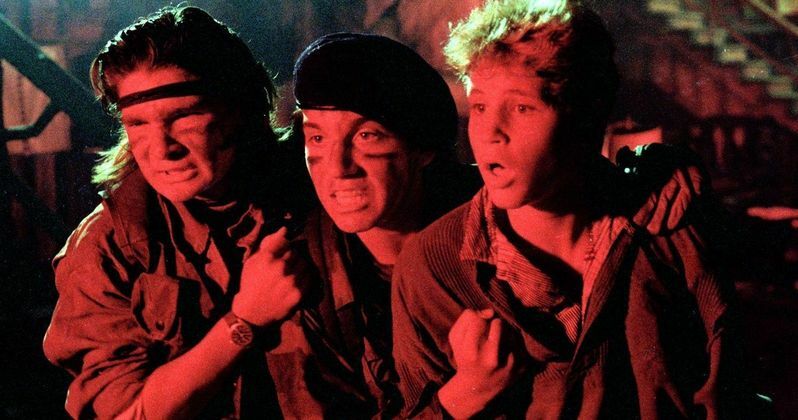 Released in 1987, this was the first time the Two Coreys worked together, and it not only stands as an iconic 80s horror comedy that redefined the vampire genre at that time, it also served as the begin of a long partnership that would flourish both onscreen and off for many years to come.